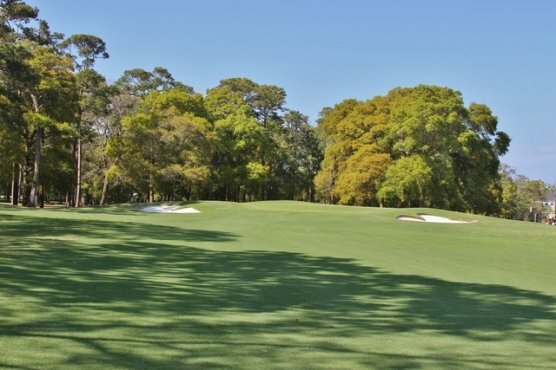 Many golfers travel to Myrtle Beach to play on our beautiful Myrtle Beach golf courses. They think that their game will be the same as it is “back home”. That is not necessarily true. There may be some adjustments that you need to make. Here are a few tips that might help on your next Myrtle Beach golf vacation. WIND – Many of the Myrtle Beach golf courses are affected by wind that comes off of the Atlantic Ocean or the Intracoastal Waterway. The conditions can vary from day to day and sometimes can change even during the course of your round. You might not feel the wind while standing in the fairway or on the tee, but when your ball rises above the tree line, it can be dramatically affected. Watching amateurs play for over 40 years I have noticed that most all of them under club. Be aware of the conditions and take more club and focus on making solid contact. SEA LEVEL – Another thing that you want to consider is that you are playing at sea level. Quite simply, the humid air is thicker and the ball doesn’t travel as far. There is no exact science for calculating this, simply hit more club. ELEVATED GREENS – Golf course architects designed many of the green complexes on Myrtle Beach golf courses to be elevated. For one it can make the game more challenging and second for drainage reasons since we are at sea level. When taking this into consideration, you will find that it is again necessary to hit more club. Hopefully these few tips will help you when visiting Myrtle Beach on your next Myrtle Beach golf package.